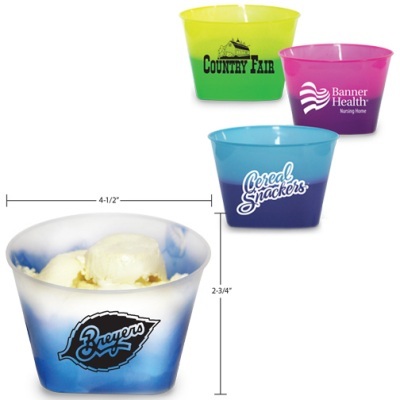 Color Changing Mood Bowls are a fun way to promote your business or special event. Great for ice cream shoppes and frozen yogurt parlors to advertise your logo or business. Also great for fairs, festivals or food demo events! Give your customers a fun promotional product they are sure to take home and remember you every time they use their Mood Bowl! These Mood Bowls change color with ice cold liquids or ice cream. Made in the USA. For another fun color-changing promotional product, we also offer Mood Spoons which complement Mood Bowls nicely! Additional charges apply for more than 1-color imprint or 2-sided imprint. Contact us at 706-374-0710 for pricing. Mood Bowls are available in frosted changing to blue, yellow changing to green, pink changing to purple, blue changing to purple. Mood Bowls are 4-1/2″ wide at top, 2-3/4″ high with an imprint area of 1-9/16″ wide x 1-5/8″ high.